The U.S. Postal Service lost $2.7 billion in fiscal 2017, less than half the deficit the agency racked up in the previous year. More troubling for USPS, however, was its net controllable income went from a $610 million profit to a $814 million loss in the fiscal year that ended Sept. 30. That marked the first such controllable loss in five years. The Postal Service cited the end to an emergency price hike that expired midway through fiscal 2016 as part of the disparity. Officials also noted a nearly $700 million increase in compensation costs as contributing to its dip into the red. Controllable income does not account for expenses beyond the influence of USPS managers, primarily a congressional mandate to prefund retiree health benefits and adjustments to workers’ compensation costs. Part of the dropoff in that calculation is what Postal Service Chief Financial Officer Joe Corbett called an “unexpected, accelerated” rate of decline in first-class mail volume. Regular, flat mail dropped off by 2.5 billion pieces in fiscal 2017, more than double the rate of decline between fiscal years 2015 and 2016. Marketing mail also dropped off by a similar number, following four consecutive years of stable volume. On a positive note, USPS continued to see growth in its shipping and packages business, where revenues grew by 12 percent. Discounting the boost the agency gained last year from the emergency price hike, its total revenue actually grew by $315 million year over year. If the emergency rates were still in place, Corbett said the Postal Service would have turned a controllable profit of about $300 million. Still, last fiscal year marked the 11th in a row the mailing agency posted a total loss of more than $1 billion. 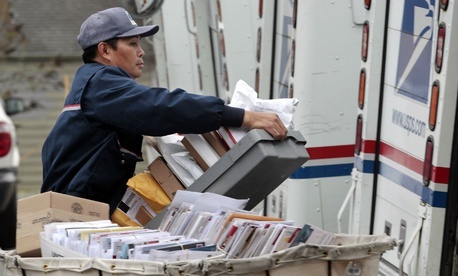 The Postal Service defaulted on $6.9 billion in required prefunding payments. The decrease in its overall losses stemmed primarily from a positive adjustment to its estimated workers’ compensation liabilities due to a change in interest rates. Postmaster General Megan Brennan said she expects package revenue to continue to grow, including a 10 percent year-over-year boost during the upcoming peak period, but it would not be sufficient to offset losses in more profitable parts of the agency’s operations. Brennan pledged to continue to “aggressively manage the business” while pushing Congress to advance a reform bill already approved by the House Oversight and Government Reform Committee and the Postal Regulatory Commission to give her more authority to set prices. Fredric Rolando, president of the National Association of Letter Carriers, said the Postal Service’s losses can be attributed largely to factors outside of the normal operations of the agency. “Addressing these external financial burdens would allow USPS—which is based in the Constitution and which enjoys broad public and political support—to continue providing Americans and their businesses with the industrial world’s most affordable delivery network,” Rolando said.